The National Turf Writers and Broadcasters will honor jockey Ramon Dominguez, racing benefactors Marylou Whitney and John Hendrickson, broadcaster Jack Whitaker and sportswriter Bob Fortus at its 54th annual awards dinner on Oct. 30 at The Derby, in Arcadia, Calif.
Ramon Dominguez won the Eclipse Award as the leading rider in North America each of the previous three years before an injury last January forced him to retire. He set the single-season record with $25,582,252 in earnings in 2012. He will receive the Mr. Fitz Award for typifying the spirit of racing. MaryLou Whitney and her husband, John Hendrickson, are well known for their generous support of racing. They will be honored with the Joe Palmer Award for long and meritorious service to the sport. They served as honorary chairpersons last summer when Saratoga Springs, N.Y., celebrated the 150th anniversary of horse racing there and donated $75,000 as part of a promotion that allowed fans to make $15,000 wagers. Mary Lou and John are known, among other causes, for their unwavering support of backstretch workers. Jack Whitaker was a legendary broadcaster for CBS who became known for his elegantly written essays on racing that allowed him to capture the magnificence of Thoroughbreds while sharing his passion for the game. He will be presented with the inaugural Jim McKay Award, which salutes excellence in broadcasting. Whitaker was inducted into the National Sportscasters and Sportswriters Hall of Fame in 2001. Bob Fortus, winner of the Walter Haight Award for career excellence in turf writing, covered racing with distinction for almost three decades for the New Orleans Times-Picayune. He was inducted into the Fair Grounds Press Box Hall of Fame in 2011. He earned a Red Smith Award for his coverage of the Kentucky Derby in 1995 and a Joe Hirsch Award for his Belmont Stakes coverage in 2009, the same year the Maryland Jockey Club saluted him with its Old Hilltop Award. The National Turf Writers and Broadcasters host an annual awards dinner on the Wednesday prior to the Breeders’ Cup World Championships. 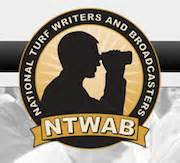 The NTWAB presents three awards during the evening—the Walter Haight Award for career excellence in Turf writing, the Mr. Fitz Award for typifying the spirit of racing, and the Joe Palmer Award for meritorious service to horse racing. Breeders’ Cup writing awards are also distributed during the evening, which typically features a cocktail reception, dinner, silent auction, occasionally a live auction, and other presentations. The Association currently has approximately 225 members and meets twice a year at Churchill Downs during Kentucky Derby and the Breeders’ Cup.